This is an excerpt from our NEW issue! From rocky beginnings as Bixi in 2011, Toronto’s bike sharing program is poised to become better than ever before. 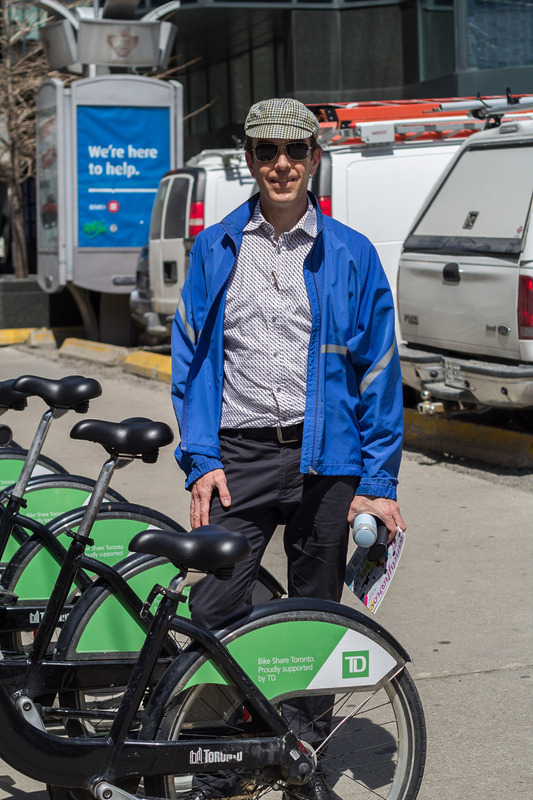 After being hampered by financial woes and taken over by the Toronto Parking Authority in 2013, new funding — including money generated by the Pan Am Games and a key sponsorship from TD Bank — is allowing newly christened “Bike Share” to add about 20 new stations and over 300 new bike docks to its network that is 1,000 bikes strong. Along with this expansion, Bike Share underwent several other changes when it was taken over by the TPA. Yearly and monthly memberships are cheaper than ever at $90 annually or $18 per month (down from $40 per month.) Daily rates have increased, however, to seven dollars from five dollars (payable by credit card only.) This adds incentive to switch to Bike Share as a regular addition to your commute. The Toronto Bike Share program began downtown and remains concentrated there, with no stations beyond the core. With the coming expansion, however, the city is looking to reach into regions such as the Beaches and Dundas West. By the end of 2015, Bike Share users could be able to travel farther while still having access to stations where they can return their bikes, allowing cyclists to get to and from the downtown core, rather than travelling exclusively within it. Bicycle sharing has become a worldwide phenomenon. Over 600 cities around the globe have their own version of bike share and, combined, these programs are on the frontline of a shift toward active transportation. However, in order to be successful, bike sharing has to be accommodated by a city that is serious about cycling infrastructure. Bike Share stations need to be connected by a complete network of bikefriendly streets, and should be located near major transit stations to better integrate TTC and bicycles into a complete transportation system. Why do you use Bike Share? "I signed up to support Bike Share, and I use it because it is so convenient. I live in Leslieville and work downtown and I ride my own bike down here. But, if I need to do something during the day or if I’m just going on a joy ride, I use Bike Share." Should Bike Share stations be located closer to subway stops? "It might be useful. If they expand as far as Pape or Carlaw, it probably would make a difference. It would be really nice if they had bikes at the stations over there." "It would be useful to have a Bike Share station at the subway station. Being a student on campus, I think it would be useful because the subway doesn’t always take you where you need to go. It would be nice to take the subway and then have a bike right outside to take you to spots that are hard to get to on transit. I think I'd like to see some more of the drop-off points spaced around, but if anything this city needs more bike lanes." 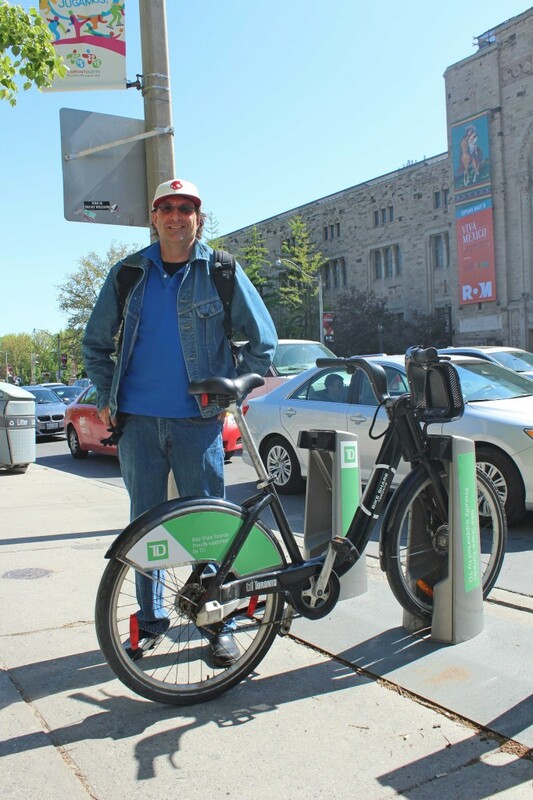 "I used a bike share in France before but never in Toronto. It’s a lot cheaper here. It’s convenient, it’s good fun, it’s an easy way to get around the city rather than getting in taxis, and it’s almost as quick as going by car anyway with all the traffic. It’s just a fun way to get around. There’s nothing really I’d change about the Bike Share system. I think I’d like to see some more of the dropoff points spaced around, but if anything this city needs more bike lanes." "It’s brilliant. It’s smart. I use it all the time. It could be great if they looked at expanding a little farther out of the core. There are a few situations where it would be great if they were closer to the subway lines. I think there’s some politics around that with the TTC. They’re improving the placement a little bit." "Having Bike Share station close to the subway doesn’t really matter to me, because I live downtown. If I’m using the Bike Share bikes I’m not using the subway. It’s pretty convenient." Marie Casista is the vice-president of real estate, development and marketing for the Toronto Parking Authority. She began working with Bike Share in 2013, soon after it was taken over by the city, and has helped it transform itself from near-bankruptcy to newfound relevance and support. 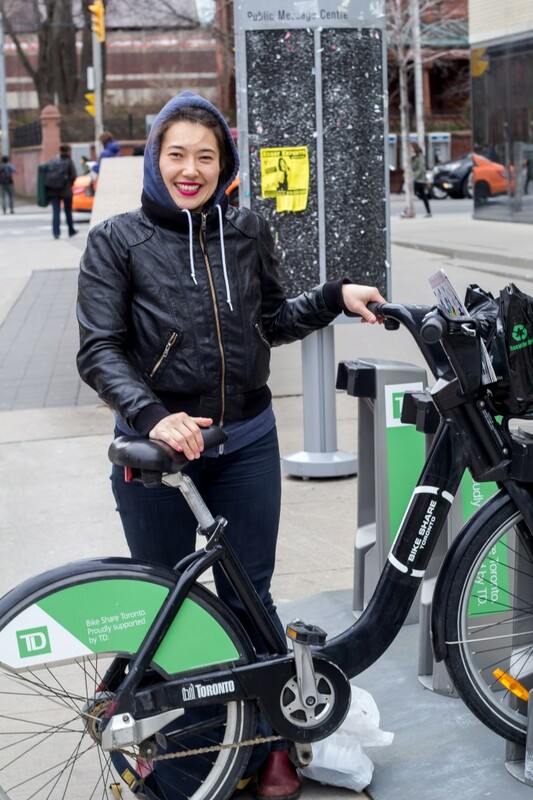 Though she is fortunate enough to be able to do most of her getting around on foot, Marie is a big fan of bicycle sharing and is excited to watch it grow in Toronto. 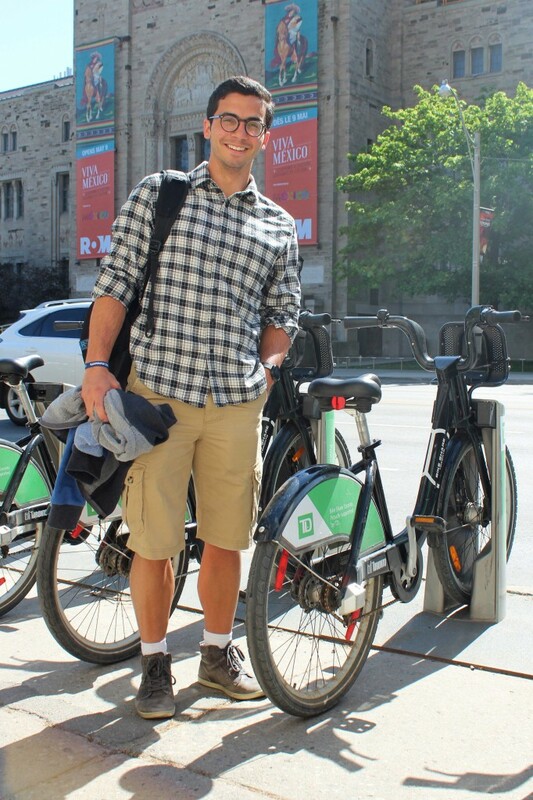 What opportunities or challenges do the upcoming Pan Am Games pose for Bike Share? The Pan Am Games bring with them a significant number of opportunities that we are excited to take part in. [It gives us] the chance to showcase our Bike Share system to support the transportation needs of athletes, their families and visitors for the games. During the games, our team will be relocating stations and corralling bikes near major events to assist with the anticipated peak demand for bikes. This is a great opportunity to assist with the transportation needs generated from the games and, of course, it will require increased attention to our logistics - but our team is up for it. What’s next for Bike Share in Toronto? Expansion of the system is what’s next for Bike Share Toronto. Expanding is imperative for the long-term success of the system – both financially and from a customer service perspective. Residents of Toronto are eager to use the system and have expressed a desire to expand into some of the major growth corridors, including Bloor West Village, Dundas West, Queen West, Liberty Village, Forest Hill Village, Danforth Avenue, Dundas East and the Beaches. An independent third party is currently undertaking a feasibility report to identify the best expansion locations. Once this report has been completed, we will use this information to purchase new stations. Since assuming control of the [Bike Share] system in late 2013, we have stabilized it operationally and financially and positioned it for expansion. The Toronto Parking Authority is committed to the long-term success of Bike Share Toronto. The new issue of dandyhorse is here! Pick up a free copy at Urbane, Sweet Pete's, Bikes on Wheels and Hoopdriver. You can buy it online here and at these independent book shops. Bike Spotting: What do you think of this new bike lane at Queen's Park?